Summary: This meal is vegan, gluten-free, and amazing. Sweet potatoes are packed with vitamins. They are the perfect autumnal dish. The addition of homemade peanut sauce creates an additional, zesty flavor that will have your friends and family members coming back for more. Most of the time, we have no idea what to do with sweet potatoes. When we were growing up, our parents treated them as a holiday side dish. Often, they were served from a can and doused with marshmallows. We endured this travesty because we didn’t know any better. Later, we discovered the fresh variety, but remained clueless about how to prepare these hardy, delicious vegetables. They were relegated to the background, and we rarely consumed them, except for Thanksgiving and Christmas. So, when we discovered this recipe for roasted sweet potatoes with red peppers and spicy peanut sauce, we became excited. This meal is vegan, gluten-free, and amazing. Sweet potatoes are packed with vitamins. They are the perfect autumnal dish. The addition of homemade peanut sauce creates an additional, zesty flavor that will have your friends and family members coming back for more. Preheat oven to 425 degrees. Toss sweet potatoes with 1 ½ tablespoon of oil and add cumin and a pinch of salt. Place in large pan or cookie sheet, spreading pieces so they don’t overlap. Roast on center rack of oven for a total of 40 minutes. While the potatoes are roasting, toss chopped red pepper with salt and ½ tablespoon oil and arrange in smaller pan. About 15 minutes after you put the potatoes in the oven, place the pan with the peppers on the top rack of oven. Take this opportunity to turn the sweet potatoes over. Continue roasting the potatoes and the peppers for 25 minutes (total time for potatoes 40 minutes, total time for peppers 25 minutes), turning the peppers over after 10-15 minutes. Vegetables should be slightly browned and caramelized around the edges. Meanwhile, cook 1 ¼ cups brown or white jasmine rice on stovetop or rice cooker until water is absorbed. Prepare the sauce in a large bowl and set aside. 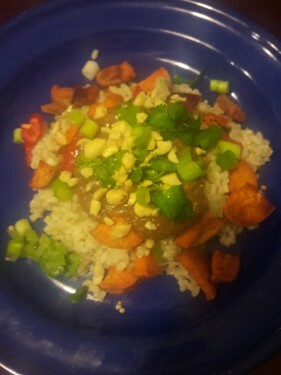 When rice and vegetables are done, scoop rice into dish, top with roasted vegetables, and then pour a generous dollop of peanut sauce on top. Add liberal amounts of your favorite garnishes and dig in! This meal serves 3-4 people and can be served alone or with your favorite beverage. It’s hearty and delicious, and we doubt that you’ll have any left over. Perhaps you should make some more tomorrow. Roasted sweet potatoes and red peppers combine with a zesty, spicy peanut sauce to make a dish that is vegan, gluten-free, inexpensive, and delicious!